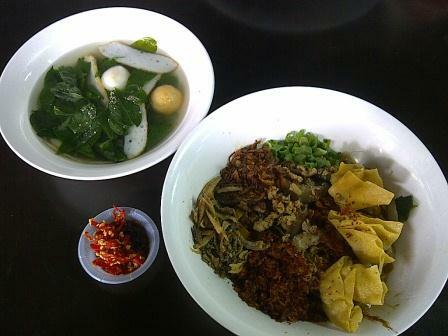 Dry pan mee can be found in most Chinese restaurants and sometimes in foodcourt. Seasoned with light soya sauce, sesame oil and a host of other flavours, topped with fried wonton and shrimps together with a bowl of fishball soup, it makes a light and delicious lunch. Usually chili paste or sambal is used for additional taste.